Born 30/06/1923 Coventry, Warwickshire. Son of Samuel John Askew and Evelyn Boyles of Earlsdon, Coventry. Sergeant (Air Gunner) 1505117 Wellington X, HE856,17 Operational Training Unit. Bomber Command, Royal Air Force Volunteer Reserve. Killed on active service 14/01/1943 Aged 21 when his plane crashed into trees whilst trying to locate an Airfield at Overton Heath, Wiltshire. Resided Stivichall Common. Gardener. Enlisted July 1941. Buried Square 312 Grave 193 London Road Cemetery, Coventry, Warwickshire. Son of Edward and Hannah Clay. Born 26/03/1923 at Leicester. Resided 18 Lowther Street, Employed at Armstrong Whitworth Aircraft Limited. Died on active service at Bletchley 10/07/1943, aged 20. Buried London Road Cemetery, Coventry. Son of Milton Leathead Currie and Henrietta Maud Earp. Born 1917. Resided 62 Eagle Street. Employed at Alfred Herbert Limited. Enlisted Sep 1939. Killed on active service 13/01/1940 at the Isle of Man when his aircraft crashed during a training flight, aged 21. Buried London Road Cemetery, Coventry. Daughter of William George Fidoe and Amy Louisa Harridence. Born 22/06/1911 at Leamington Spa. Resided at 35 Siddley Avenue. Employed at Courtaulds Limited. Died on active service from Cerebral Haemorrhage 21/04/1944 at Loughborough Hospital, aged 32. Buried London Road Cemetery, Coventry. Son of George and Lucy Hartwell. Born 17/06/1920 at Coventry. Resided 14 Monks Road. Employed by Francis Flynn Limited. Died on active service 19/05/1943 at Raigmore Emergency Hospital, Inverness, aged 22. Buried London Road Cemetery, Coventry. Son of Thomas James and Nora Eugenie Kedge. Born 30/06/1920 at Coventry. Resided at 82 Kingsland Avenue. Employed by G.R. Marson Limited. Enlisted 23/02/1939. Died on active service 11/01/1942 at Kingsland Avenue, aged 21. Buried London Road Cemetery, Coventry. Born 01/06/1921 at Coventry. Son of Wilfred Langshaw and Violet Alice Fulford of Stoke, Coventry. Resided 28 Browning Road, Stoke, Coventry. Educated King Henry VIII School. Employed Morris Motors Limited. Royal Naval Volunteer Reserve enlisted 19/08/1940. Killed on active service, Cornwall 28/07/1941 Aged 20. Buried grave Reference Square 303, Grave 74 London Road Cemetery. Son of Richard and Marion Sly of Stoke. Born 25/05/1926 at Coventry. Resided at 49 North Street. Employed as a Van Driver for C.H. Elson and Sons Limited. Enlisted 12/08/1944. Died on active service 12/07/1945 at Bulford Camp, aged 19. Buried London Road Cemetery, Coventry. Son of Walter Joseph and Lilian Sproson, of Coventry. He was a Blenheim pilot and was shot up over Germany, but managed to return his aircraft to base. Unfortunately he and all his crew subsequently died. 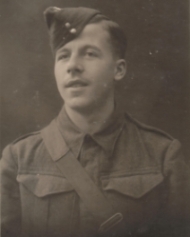 Sidney passed away on the 23/03/1941 aged 23. His brother was informed that Sid had been killed in action, so obtaining leave from his Station Commander he cycled from Plymouth to Coventry to take charge of the funeral arrangements. He went to the Mayor's Office to seek advice and support re the funeral details. Whilst he was in the Mayor's office an urgent telephone call came through for the Mayor..........it informed him that his son had been killed in action whilst serving in the RAF. The Mayor asked if he would help him sort out his son’s funeral, which he did as he had the necessary contacts within the RAF to make things less painful. Consequently these two brave young men were buried alongside each other. Ernest Arthur Stote was the youngest son of Alfred Harold Stote and Nellie Finch of 22 Mile Lane, Cheylesmore, Coventry. Brother of William, Sidney, Elsie M, Gladys M and Doreen L Stote. Ernest died 18/10/1941 aged 21 as the result of a motorcycling accident at Romsey, Hampshire. He is buried together with his parents square 231 grave 38 London Road Cemetery, Coventry. Son of John Henry and May Tayton. Born 20/12/1908 at Coventry. Husband of Iris Irene Tayton of Macclesfield Cheshire. Resided Brandon Road Binley. Employed by Courtaulds Limited. Killed returning from air operations over an Enemy Country when his plane, which had been badly hit, crashed near Chippenham 20/05/1944. Aged 35. Buried London Road Cemetery, Coventry. Born 1915 at Coventry. Eldest son of Arthur Veasey and Jessie Ann Ross of 87 Lowther Street. Nephew of Alderman J. A. Mosley (Mayor). Educated Frederick Bird School. Toolmaker employed Cornercroft Limited. R.A.F Volunteer Reserve. Pilot killed in a flying accident 26/03/1941 Aged 25. Buried grave Reference Square 275, Grave 99 London Road Cemetery, Coventry. Born 04/11/1917 at Nuneaton, Warwickshire. Husband of Gladys Hobson of Earlsdon, Coventry. Father of John, Barbara and Michael Woodcock. Resided 7 Broomfield Road, Coventry. Employed as a Boot Repairer Coventry and District Co-operative Society. Enlisted 01/09/1939. Died 08/06/1944 Aged 27 at Margate Hospital as the result of an accident whilst on active service. Buried London Road Cemetery, Coventry. This link takes you back to the list of Second World War burials. Already the best-selling English-language guide to the area, universally known as 'THE BIBLE', this is the sixth, completely revised, up-to-date, much expanded edition of the DEFINITIVE GUIDE TO THE D-DAY NORMANDY LANDING BEACHES. Written to the same highly acclaimed formula as all of the other books in this important series of Battlefield Guides (Somme, Ypres, Gallipoli, Market-Garden, Western Front - North, Western Front - South). Once again the cold facts are interlaced with anecdotes of bravery, humour, sadness and humanity.